RAM Security Solutions offers complete security camera solutions that include indoor and outdoor CCTV security cameras with or without night vision capabilities. The systems we supply and install support 4, 8 or 16 cameras with the ability to view the video feed remotely over the internet in real-­time using a broadband connection. These systems can even be controlled by and viewed on your iPhone. It is also possible to view recorded video footage of specific events after the fact. RAM Security Solutions has a security camera system that will meet your security needs and available budget for your commercial or home security systems in Melbourne. Digital video recorders (DVR) that record the camera outputs can be set-­up for continuous recording, scheduled recording or motion detection recording. Most will recycle available disk space by automatically overwriting the oldest recording and many other features are available to handle or warn of recording system reboots and loss of individual video feeds. Playback capabilities include the ability to perform a video search according to date and time and to play, rewind and fast-­forward video footage while recording. Once the required video footage is found it can be exported as single frames or as video clips to .avi or .mpeg files with a date and time stamp attached. 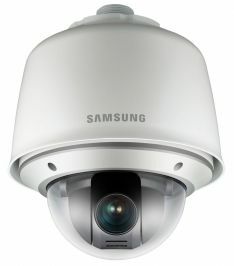 For high-­end applications RAM Security Solutions can supply cctv security camera systems that include vandal-­resistant security camera enclosures, security cameras with pan, tilt, and zoom (PTZ) capabilities, high frame-­rate (30fps per channel) digital video recorders and central monitoring capabilities. PTZ security cameras can be remotely controlled by an operator using a joystick on the control unit. Depending on the security camera’s capabilities it can be rotated 360 degrees and will allow up to 100x optical zoom. PTZ security cameras can be programmed to automatically follow a set sweep-­pattern or dwell at fixed positions for a period of time. This feature allows the user to cover more area with fewer security cameras. 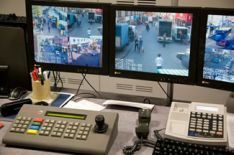 For sites that have full or part-­time security personnel, the video feeds from multiple security cameras can be combined at a central location using central 24 hour alarm monitoring station hardware and software. This gives security personnel full control of the system and full awareness of the area covered by the security cameras. 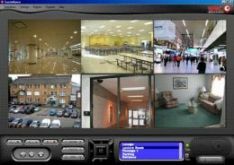 Depending on the security camera system configuration, recorded video can be archived indefinitely or retained on-­line in the real-­time system for up to two months.